GANGNEUNG, South Korea -- South Korea's Choi Da-bin pulled off a nearly clean free program routine in the ladies' singles to make the top 10 at her Olympic debut on Friday, with the PyeongChang Games' figure skating events ending in style. 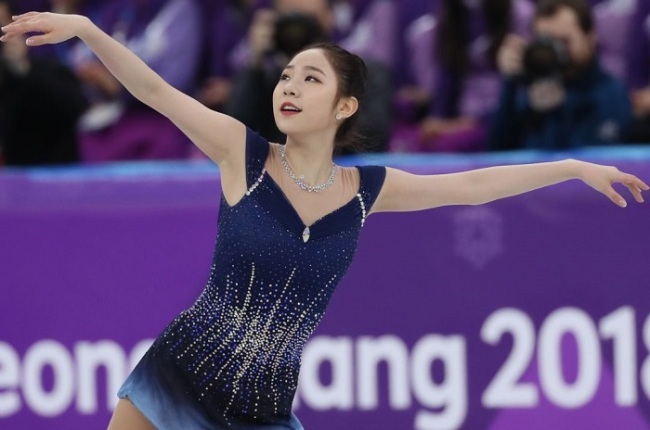 In the ladies' figure skating free program held at Gangneung Ice Arena, the 18-year old received 131.49 points and finished seventh with 199.26 points overall. Both scores are new personal highs, beating the marks set at the World Championships last year. Choi became the first South Korean skater to achieve a top-10 finish at the Olympics besides two-time medalist Kim Yu-na. The gold medal went to Alina Zagitova of the Olympic Athletes from Russia, who won the all-Russian battle against her teammate Evgenia Medvedeva. The 15-year took 239.57 points in total, beating Medvedeva by 1.31 points. Canada's Kaetlyn Osmond finished third to earn bronze on 231.02. Skating to the original soundtrack from "Doctor Zhivago," Choi tried an opening triple lutz-triple toeloop combination, but missed the second triple jump. After executing a couple of clean triples and combination jumps, she combined her triple salchow with a double toeloop to make up for her mistake in the opening jump. She was nerveless on her Olympic debut. She was hardly affected by the flaws at the beginning of her routine and ended up breaking her personal highs in all three segments -- short program, free program and overall points. After her performance, a flood of bouquets and dolls was thrown onto the ice from the home crowd in celebration of the teenage skater's first Olympics. "I made some mistakes in the program, but I'm still happy that I finished my Olympics," said Choi. "I've gone through many difficulties throughout the season. But my family, friends, coaches and mother have supported me and encouraged me to stay on ice." She lost her mother due to cancer last year but she still made it to the Olympics. "If she were here, she would have given me a warm hug," she said, with tears in her eyes. "All my family members supported me a lot. I want to say thank you to my dad as well." Meanwhile, her teammate Kim Ha-nul, who was 21st after the short program, performed a perfect free program to receive a personal high of 121.38 points, helping make up for her disappointing short program score of 54.33. She ranked 13th with an overall 175.71 at her first Olympics. Friday's scores were far higher than her old records of 111.95 for free skating and 173.19 in total, both of which were set at the 2018 Four Continents Figure Skating Championships. "As I had poor short program, I thought I have nothing to lose in the free program," said Kim, who is 15 years old and the youngest athlete in Team Korea. "I was grateful for having a chance to show my free program. I tried to enjoy my skating with the audience."